Plate with youths and winged horses , ca. 5th–6th century A.D. This gilded silver Sasanian plate features an unusual scene that borrows from Graeco-Roman prototypes and possibly Iranian ones as well. Two youths stand on platforms facing one another, each holding a staff and the reins of a winged horse, reminiscent of representations of the hero Bellerophon and Pegasus as well as of the Dioskouroi (the divine twins Castor and Pollux). Both horses bend their necks down to drink from a large vessel supported by a female figure, who appears in bust form emerging from a frieze of half-palmettes. She is most likely either a personification of water or the Iranian river goddess Anahita. In the background, a small cross-legged figure plays the lute. The scene may have cosmic significance, if indeed the two youths represent the constellation Gemini, called Do-paykar in Middle Persian astronomical texts. Sasanian silver bowls were usually hammered into shape and then decorated in various complex techniques. On this plate, pieces of metal were added to create areas of high relief, and other details were achieved through the use of repoussé. Date: ca. 5th–6th century A.D.
Acquired by the Museum in 1963, purchased from Nuri Farhadi and Habib Anavian, New York. “Sasanian Silver: Late Antique and Early Mediaeval Arts of Luxury from Iran.” The University of Michigan Museum of Art, Ann Arbor, August 1967–September 1967. "Origin and Influence, Cultural Contacts: Egypt, the Ancient Near East, and the Classical World." The Metropolitan Museum of Art, New York, December 18, 1970–April 23, 1971. "Wealth of the Roman World. Gold and Silver AD 300-700." The British Museum, London, April 1, 1977–October 1, 1977. “The Royal Hunter: Art of the Sasanian Empire,” Asia House Gallery, New York, The Dallas Museum of Fine Arts, The Cleveland Museum of Art, 1978. “The Metropolitan Museum of Art: Selections from the Collection of the Ancient Near East Department,” MOA Museum of Art, Atami, Japan, The Aiche Prefectural Art Gallery, Nagoya, Japan, The Seibu Museum of Art, Tokyo, Japan, 1983. “Les Perses Sassanides: Fastes D’Un Empire Oublié, 224-642,” Musée Cernuschi, Paris, September 15, 2006–December 30, 2006. “Glass, Gilding, and Grand Design: Art of Sasanian Iran (224-642),” Asia Society, New York, February 14, 2007–May 20, 2007. Crawford, Vaughn E. 1964. The Metropolitan Museum of Art Bulletin 23 (2), Ninety-Fourth Annual Report of The Trustees for The Fiscal Year 1963-1964 (Oct., 1964), p. 56. Harper, Prudence O. 1965. "The Heavenly Twins." The Metropolitan Museum of Art Bulletin 23 (5), Jan. 1965, pp. 186-195. Crawford, Vaughn E. 1965. "Some Notes from an Excavation." Apollo LXXXII, No. 43 (September 1965), p. 218, fig. 14. Metropolitan Museum of Art. 1972. Guide to The Metropolitan Museum of Art. New York: The Metropolitan Museum of Art, p. 54, fig. 26. Ghirshman, Roman. 1974. "Les Dioscures ou Bellerophon?" In Ph. Gignoux and A. Tafazzoli (eds.). Mémorial Jean de Menasce. Fondation Culturelle Iranienne. Louvain: Imprimerie Orientaliste, pp. 163-67. Kent, J.P.C. and K.S. Painter (ed.). 1977. Wealth of the Roman World. Gold and Silver AD 300-700, exh. cat. The Trustees of the British Museum, pp. 148-149, no. 311. Harper, Prudence O. 1978. The Royal Hunter: Art of the Sasanian Empire, exh. cat. New York: Asia House Gallery, no. 8, p. 42. Hibbard, Howard. 1980. The Metropolitan Museum of Art. New York: Harper and Row, fig. 115, p. 63-64. Harper, Prudence O. 1983. 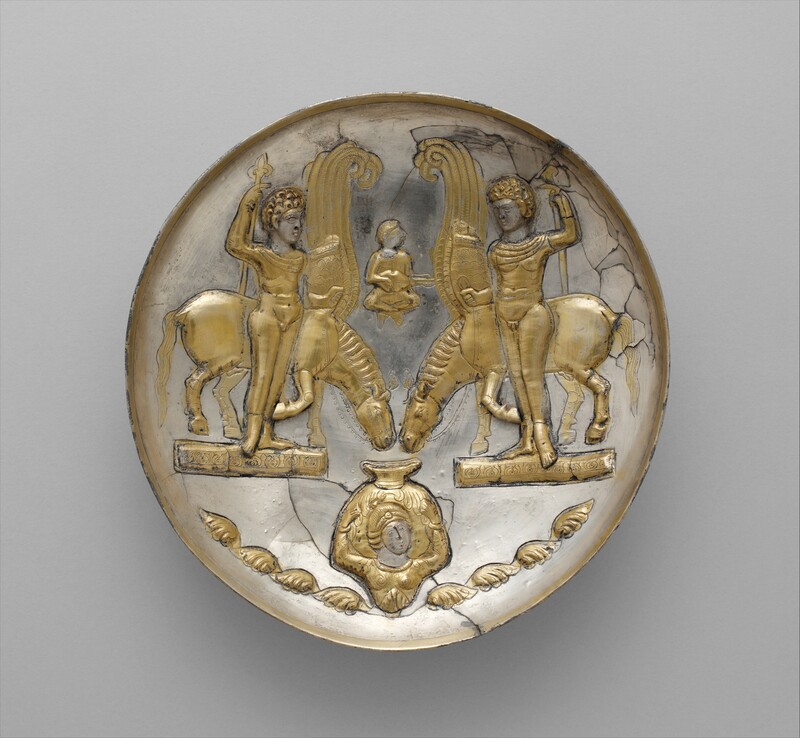 "Plate with Youths and Winged Horses." In The Metropolitan Museum of Art: Selections from the Collection of the Ancient Near East Department, exh. cat. Tokyo: Chunichi Shimbun, no. 90. Harper, Prudence O. 2006. “Plat. Deux Jeunes Hommes aux Chevaux Ailés.” In Les Perses Sassanides: Fastes D’un Empire Oublié, 224-642, exh. cat. edited by Franҫoise Demange. Paris: Paris Musées, no. 37, p. 99. Artist: Date: ca. 5th century A.D. Artist: Date: ca. 3rd century B.C.–1st century A.D. Artist: Date: ca. 5th–6th century A.D.